In Obaidulla Baig we have lost a genius. He was a man of great integrity and respect. I think the writer has written the best blog but feel that enough space has not be given to Iftikhar Arif who was his partner in Kasauti, another genious. To revive the memory of Obaidullah Baig, I suggest PTV should air one or two programmes of the past Kasuati so that people can again have a chance of having a glimpse of him. May Allah bless him with Jannah and all the best in the eternal life. I grew up watching Kasuti. It was so much popular at our home that everyone would be glued to TV for that time. Remarkable personality. They gave us knowledge not just information. Irony of Pakistan that good minds are leaving as they have to but no new ones to fill their shoes unlike most of the world. Lets all of us together appeal to PTV to put all programs of KASUTI on youtube. can you plz name his novels and name of their publishers? A huge loss to a nation which is directionles and have scarcity of intellectuals.Rather Iwould say that intellectuals have lost their values among so called moderen society and as a result such big loss have yet not been recognised by our media(both print and electronic).Any how I pray for him and his family and request the same from every reader of this blog. He made a big impact on his TV audiences. May he rest in peace. No doubt, Obaidullah Baig was a genius person. I used to love seeing his programme 'Kasauti' started in 1967 and used to wonder as a teenager what a genius person Pakistan has created. May God Rest his soul in peace. we really need to sit down and think 'why program like Kasoti will fail today' ? Mr. Obaidullah Baig no doubt you will be missed by your true fans. May God rest your soul in peace. Pakistan has lost a great man - a man of immense knowledge. While I really liked the article, it primarily focuses on Kasauti only. Obaidullah Baig was much bigger than Kasauti. While there is brief mention in the article, he was a quality documentary film maker on wildlife, travel and history, and his documentaries were of a very high standard. He was a rare commodity in Pakistan. Will be sadly missed by people of my generation particularly (born prior to creation of Pakistan). Thank you Farah Zaidi and thank you DAWN for this coverage. Obaidullah Baig earned it. Great Loss of Pakistan, friends, viewers and readers. MAY ALLAH FORGIVE HIS SINS (IF ANY) and GIVE HIS ETERNAL SOUL A SPACE IN "JANNATUL FIRDOUS". Ameen! Pls share the name of some or all of his books. Will be very obliged. I was a kid those days when Kasuti was a hit on PTV. We didn't have TV but would go to our neighbor's house and our entire family would then watch the most watched program on PTV. After the show, we would then imitate the trio of Kasuti to solve the puzzle. It stimulated our brain and we had so much fun regardless of our ages and gained the knowledge. God bless his soul. He will always be missed. I play Kasauti with my 12 yr old son here in California as I was motivated as young person watching Obaidullah Baig s Kasauti while growing up in Karachi.We should never stop this great tradition .Our generation will always be thankful to Obaidullah Baig & Kasauti team for making us knowledge seekers. “the real crisis in this country is the intellectual and moral decline.” Very true. The moral decline is because of the Media showing immoral stuff all the time. Really a great intellectual loss to the nation. With the passing of Obaidullah Baig we have lost a truly great person. An interview of Iftikhar Arif, Quraish Pur his companions in Kasuti shown on DAWN will be a fitting tribute to the great man. DAWN has the resources to make this a memorable event for us all who as some one earlier said grew up watching Kausti. If Aslam Azhar sahib is available he will also share his memories about this self taught genius. Yes, I am 34. Followed the show and was mesmerized by their intellect, wit and wisdom when I watched the revamped version in 1990s. Truly an irreplaceable loss to the nation. May Allah be with his family in this difficult times and grant him eternal happiness. Ameen. very good idea indeed. I think a replay of old Kasauti programs may be helpful in shifting the minds of our young generation from time wasting Indian TV serials, useless politically motivated discussions, etc etc. Let something be done to raise the standard and quest for knowledge, of your youth. I think a lot of credit should also be given to persons like Aslam Azhar for bringing out geniuses of Obaidullah Baig, Iftikhar Arif, Qureshpur and later Ghazi Salahuddin onto tv screens for all of us to learn and appreciate. May Allah bless him and grant jannatul firdous to his soul, Ameen. Obedullah baig was a king of knowledge and greatest of Pakistan, his polite dealing nice mannar of disscusion was highly intalectual. There were hardly anyboday who left unsatisfied after discussion with him. I had enoumus meetings with him and with lots of questions, but always he had a very simple and well balanced answer. I firmly say that I have learned a lot from him. He was beloved of everybody and a friend in need. Pakistan has lost a prominant scholar and a patriot. It is a hard luck of our countriy that we never keep these kinds of valuable people as a pattren for prpogressive development of the country. Obaidullah baig, true intellectual prodigy has made us realized that formal education differs from intellectual awareness. He has surely left a gap that no other entertainment quiz show can fill. May his soul rest in peace! Indeed a great loss. I vaguely remember watching Kassauti in my childhood but I do remember how people in our home were hooked to kassauti and it also created an early likeness of this program in me. It was also when i first got to know about Obaidullah Baig and I used to wonder about how a man can have so much knowledge on so many different topics. Very well written and an emotional piece, Pakistan has lost a mastermind whom we all know him through our early days program KASUTI. He was an intelligent and humble and will always be remembered. RIP Obaidullah Baig. I am a working professional and a student also, I always admired Sir Obaidullah Baig as a great teacher and a humble person . whenever he was him on TV I postpone all my plan and listen to him. Me and my friends till this day play Kasauti sometimes among ourselves and I am sure there would be at least few more if not much groups like us who appreciates the intelligent minds of Pakistan. It is a great loss to all of us. I don’t not have words to express my feeling. People like Mr. Baig are very rare to find “ONE IN A MILLION YEARS”. Today when I came to know about this tragic loss to the nation I am very sad but with it my heart felt another pain which compelled me to express my feelings. I could not find any comments? what happens to us guys …………………….. I have never ever before posted any comment not even on face book but to read about such a great loss and still be silence. Where are we going Nation…….. ??? I am amazed and happy that still we have few ( like Farah) who adores Jems who have casted a life long imprint in our mind and our society for better tomorrow. Farah, your article regarding this jem( Mr. Baig) is a testiment of your interest and committment to pakistan society and it's well being. excellent article!!! Pakistan has lost a shining star. But all is not lost yet. As parents of the future generation it is our duty to inculcate the importance of reading and free thought so that our future generation are freed from the chains of bigotry and fanaticism. I was a kid when I first started watching kasoti. The program ignited in me a curiosity and a desire to acquire knowledge. My father, sensing my curiosity, started taking me to ‘Khori Garden’ – second hand books was all we could afford at that time. That curiosity has helped me throughout my life. Obaidullah Baig and Iftikhar Arif were my heroes when I was a kid. I am forever indebted to them. May Allah grant the best to the soul of Obaidullah Baig. I still remember Kasauti and yes it did have a profound effect on my generation. The loss of Obaid Ullah Baig is big and even bigger in Pakistan's case as there are none replacing him and the likes. It's sad day for me. He was a colleague in PTV, but a giant of a man who was role model, yet humble and caring. Our paths crossed one night when I was asked to appear on Kasauti in January 1972 by the then head of PTV, Aslam Azhar as part of the interview selection process as the national network opened its doors to working journalists to fill its newsrooms. "Rousseau", i wrote down and to my astonishment, neither Baig nor Arif Iftikhar could guess the name in 20 questions, and I got the job as a reporter in PTV until driven out in 1978 after the Zia Martial Law. Decades later when the show was reintroduced a few years ago, one of the guests wrote down my name as "shaksseeyat" and Baig sahib had zeroed in to the target in less than the 20 questions. I have stopped praying, but for Obaidullah Baig, I will say a dua. God bless you 'sirji', you will always be remembered. My family and I were keen viewers of Kasuati. Obaidullah Baig, Qureshpur, Iftikhar Arif and later on Ghazi Salahudin provided knowledge, impeccable Urdu and an aura of scholarly presence. The pleasnt way in which the programme was conducted unlike the present day anchors who leave no stone unturned to turn on the heat on its guests and make them feel uncomfortable. With Obaidullah Baig's passing away, an era has ended where there was mutual respect, love for subjects of interest and general bonhomie. his program Kasauti was the only attraction for what we thought was made for our parents that we also found interesting other than the imported children TV programs that we all grew up watching. what a personality Mr. Baig was? we will all miss him. may Allah bless him with a highest muqam in jannat simply on the basis of his spreading knowledge alone. thank you for sharing the thoughts of so many Pakistanis. A true loss that cannot be paraphrased in words. The decline of intellect in Pakistan is tremendous, and while lamentations about the bankrupt status of the country is alomst generic talk, most people overlook the paucity the country has when educations, morality, character and intellect are parameters. People like the late Obaidullah Beg should be designated as international treasures. The whole world has so much to learn from such wonderful human beings. The demise of such intellectual giants is a blow to a fast disappearing world of ethics, living one's culture and a desire for all round knowledge which makes for a better and tolerant world. Have never seen Kasoti... :(( but i am a gr8 fan of Mr. Obaid-ulla Baig =) lost precious Gem!! May Allah forgive his sins, and the place in jannah. He was a jewel of knowledge,a thorough gentleman and a man of dignity. God had bestowed upon him genuine wisdom. These kind of gem are rarely created. May Allah forgive him and grant him Jannat-ul-firdaous (ameen). "Dhoond ab un ko charagh-e-rukh-e zeba lay kar"
I now at 50 was in 4th grade when I first saw the program on TV Kasauti and immediately became a fan. I revisited some of the programs available on Ytube and thoroughly enjoyed. In fact program Kasauti was a kind of face of PTV at that time in early 70s. Obaidullah Baig was a man of many talents. He was an intellectual, his work on wildlife in Pakistan was one of his greatest achievements for himself and his country. To offer my heartfelt condolences to his family I would say: We share your undoubted grievances and sad loss and so pray that Allah will bring him to rest through his mercy in his heaven and to alleviate the hearts of you and your dear family to Allah we belong and to him is our return. A great intellectual loss, Baig Saheb was a symbol of knowledge, learning and intellectual awareness, a rare commodity in Pakistan today, may his soul rest in peace, and hopefully, since he was an inspiration for so many of us, the fire that he lighted in our hearts and minds would keep alight. 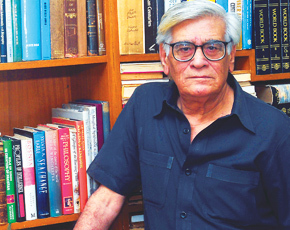 A true legendry figure .you can easily relate to the childhood dreams of the ideal personality once used to be in Obaid ullah Baig.A Pakistani who should be remembered not only as a compare but also a researcher. I still remember "Sailany key Saath "when he took us to remote areas of Pakistan.May Almighty rest his soul in peace Aamin. He set a unique example for all ages through his Kassoti , how to dig out hidden facts with smiles, consistency & passions based on updated knowledge. In fact we loosed another genious who are formed in centuries. May allah bless him. No doubt he was an asset to this nation. We hardly remember such people in our ruling class. Such a saddening news. I have no words to describe the grief I am feeling after hearing this shocking news. Just loved the man eternally...He was a role Model.The aura of grace, intellect, honesty and humility sparks every thing and every one around him. Though everyone has to go one day but when some people r gone for this unknown voyage one just cannot absorb this departure. Loss of a noble soul, full of modesty and grace, not to mention his wealth of knowledge. I had the good fortune of meeting him few years back and found his impeccable grace overwhelming. May God in His goodness and mercy bless his soul and offer him a place in heaven. I was glued to Kasauti without any shadow of doubt and also had the opportunity to meet the genius, Obaidullah Baig. His grace and modesty was par excellence. The entire Pakistan will miss him for years and years to come.May God in His goodness and mercy bless his noble soul and offer him a place in Heaven. I am fortunate to grow up with Kasuti quiz program and watch great intellect of Obaidullah Baig, i also watched his second round of Kasuti started recently and rekindle and watch Obaidullah Baigs sea of knowkedge, I think with all his intellect he was an institution who i can compare to great scholars like Sir Syed Ahmed Khan, his demise is a great loss to all not just Pakistan. Sir, please don't stop praying. It's Allah's one of the Greatest Blessings... May Allah Rest Obaidullah Baig's soul in eternal peace and Grant us fortitude to continue his good work and inspire our nation... Sir, please continue praying for all. He made a big impact on his TV audiences. He will be remembered for long time, May allah rest his soul in peace.An award should be announced as given to waheed murad. Dear Young Pakistan...Do you find a legend as original, as unique and as thorough a gentleman as Sir Obaidullah Baig among yourself? If you do, let me know. If you don't, then remember him and Pakistan. Today, we have lost a great part of civilization. I was truly, truly saddened. Baig sahib was type of person who seemed immortal to me. His knowledge, his intellect and his style of presentation in pure urdu without any mixture of english showed the depth of his knowledge and grasp on the subjects. We have lost an icon of great intellectual status. The moral and intellectual decline we see in our talk shows and other TV hosts makes it extremely sad day for Pakistan. May Allah give you the highest place in jannah, ameen. Sir Ji was indeed a rare gem. May God rest him in peace. We grew up in Pakistan watching this fantastic show of three highly qualified gentlemen with excellent memory.There was hardly a question that they would be unable to answer.I am sorry to note that MR Obaidullah Baig has passed away may his soul rest in peace. Ameen. I am not sure where the other two gentlemen are. What we need to observe today is that he is remembered for his humlity. Hard work and pursuit of excellence with humility is what we need to develop and train younger generation on. May Allah grant you Maghfirat Mr. Baig. Hope we had thanked you for your services. Governmenyt should make a civil award or honor or at least a university after Obaid Ullah Baig Sahib's name. Obaidullah Baig was a living encyclopedia, a great intellect, yet a very humble man. In the last 1-2 years I saw a new quiz programme like Kasauti, called Kasauti Mastermind, on TV One, a Pakistani channel, compered by Quresh Pur with Obaidullah Baig as doing the guessing. It might be beneficial if Quresh Pur, Salahuddin & Iftikhar Arif could continue this or start a similar quiz on any suitable channel, or if PTV could re-telecast the old Kasauti. It may inspire young viewers to read more & acquire knowledge, and serve as a sort of tribute Obaidullah Baig. Just hats of to him,may Allah rest him in peace and tranquility.He was my hero, a very few who impressed me and left their imprints. Mr Baig was Masha Allah, nothing but a pure genius. Regretfully we hardly have anyone that can replace such masterminds in Pakistan. Whether we talk about intellectuals or performing ...and even sports... Such a sad day..
mr baig and mr.arif as friends whom i met at radio pakistan karachi invited me to participate in kasauti on ptv in late 60s. ibn insha i and another lady were guests.with mr obaidullah it was an unforgetable experience of lifetime.i learned more from him than the other way round. he attended a couple of gatherings with me at closeby swami narain temple. he was kind enough to introduce me to abunch of par excelance scholars in every conceivable subject 'especialy languages and religions .he will be missed by one and all! Baig sb. you were one of the few jewels Pakistan has had and will never be able to replace. You were the icons of "golden times" for Pakistan. Hope for such revival is too dim, given the facts what the Country has changed into. It is hard to find words to express my sorrow for the great legend of Pakistan,Obaidullah Baig. I was a kid when I started watching Kasauti in late sixties. The show has a profound impact in my life. I still love to explore things and read books, watch national geographic and google internet to increase my general knowledge about the life and universe. I have two grown up boys and I used to play with them ," Thinking Game" every night on their bed and they still ask me some time about it. May God bless his soul in Jannah. We lost a fine person. I met him at his home in Rawalpindi and I still remember how easily he explained me world geography. May Allah bless his soul. I was always mesmerized by Kasauti in the 70's. Lo and behold, I had the pleasure of meeting Obaidullah Baig for 90 minutes in the 90's. He was stuck with me on a flt. from Karachi to Islamabad. I have never met anyone with this unique combination of humility, intelligence and knowledge ever in my life. Pakistan has lost one of its greatest son! May Allah bless him with Jannah and all the best in the eternal life. Sad news Uncle Obaid was my family friend, I remember when he shifted to Karachi he use to come to our house everyday,I use to have long discussions with him I always considered him a great intellectual, I am lucky to have known him and called him Unce Obaid, Met him last time in 1996 after that I moved out of Pakistan and now I hear this sad infact very sad news of his demise. "...why program like Kasauti will fail today?" Because the attitude of our younger generation has changed so rapidly with the introduction of Indian and other Foreign Channels that we have lost all interest in our own plays and programs. Now Pakistani Dramas who were once a gem of a stone until few years back, lost all their credibility. A recent hit "humsafer" is not a match to any of our old Dramas. Yes it is a big loss. I was in school when i first started watching Kasauti, and indeed it became one of my favourite programes. I remember, in 1968, i was in class ninth , at the Government Boys Secondary School No. 1, Nazimabad , when one day our school had invited Mr. Obaidullah Baig to our school. I still see that moment in memory, when the boys were just pushing one other, just to have his autograph. He was simply a celebrity. Those were the days, when the Government schools used to be considered as GOOD schools, and the position holders used to be the students of Government schools. I remember, how our teachers had started playing Kasauti in our class, during the free periods. Indeed those were the days when the teachers were respected by the students, and the teachers used to love the students. Their mutual relationship was never biased on the basis of religion, cast, political affiliation, languages, etc etc etc. Indeed we do need people like Obaidullah Baig and others of the like if we want to rebuild our nation. I agre with Ghazi Salhuddin's analysis that Pakistan has lost somebody who cant be replaced simply because our education, intellectual and moral systems have declined signifincantly, reasons for which are illiteracy, the loss of our grip over both Urdu and English languages and misunderstood religiosity that discourages free thought. I barely remember kasuti of the 70s. Growing up in Pakistan we used to play Kasuti with our friends and today after leaving the country for around 15 years or so the legacy continued. It threw me back in time when today my son (born and raised in a foreign land) asked me to play the same 20 question game. He asked me about Burj Khalifa and challenged me to guess it in 20 questions. A great loss...Obaidullah Baig was one of the true treasure of our country. I wish as a tribute TV channels should re-run "Kasauti". May Allah rest his soul in peace and give higher place in Heaven. Ameen. I have had the great pleasure of meeting him twice in 2004 and 2005 when we had invited him to a conference. I was required to brief him on his role and what he was supposed to talk on. With youngsters having an attention span of a goldfish and their need to be engaged, Baig sb's style was most inappropriate or was it? The youth tired and actively disengaged did not know who Baig Sb was. But when he came on minus any theatrics, he captivated them. He weaved such great stories, embellished with details and imagery that I could see his audience losing sense of time and space. The session ran much longer than scheduled and by the end Baig sb's humility, genius and his disregard for approval had won everyone over. 7 years down the road and I still remember his narrative. I fully endorse your ideas, he was a true scholar and genius indeed and very humble. He was the most cultured and civilized person among us. May Allah protect him in his grave, on the day of judgement and bless him with Jannat Al-Firdaus. Baig has died, there was hardly any worthwhile coverage on electronic media. In today's world life is becoming fast and technology dependent and at the same time we are moving away from culture, tradition, literature and value of life. We should try to remind our new generation the value and importance of these elements and let them know that Obaidullah Baig was one of such giant who had a deep impact on the generation of that time. A very well written piece on some one who was revered and idealised by many. Sir, Please don't stop preying for hem. You are right Mr. Haris . Actually that's reason of crisis. Sir ji go and get a survey who wants to watch Kasuti...time wasting Indian TV serials, useless politically motivated discussions, etc etc have been injected in our young generations looking no soln..
All that cometh from Him shalt return to Him. But some departing souls leave behind their memories of wonders they produced in their life times. Obaidullah Baig was one of them. He was as idolized by all class of people - kids, teens, old ones and not to mention the academia class - all revered him. These small things make a differrence in life. He was adored in his life time. He produced wonders when there were no internet domains, there were no search engines. He proved human intelligence is superior than artificial intelligence.__Who says he head. He is alive in everyone's heart.